On Sunday, December 7, 2008 I first wrote this article, quoting Mark Twain. As I listen, momentarily, to President Obama talk about the new finaincial reform bill he is about to sign, I am reminded about liars and figures. He speaks so smoothly, as he reads the words. One would think that he had personally saved the American people from any financial disaster that might befallo them in the future. What bull! Yet, people believe his words. Good people. My friends and yours. At a social gathering recently, I saw a perfect example of the point I want to make. I watched, amused, as two friends got red faced, nose to nose, on the cause of the economic problems the country is now going through. The farmer pointed out the fact that special deals were being cut for the unions that hurt the rest of the nation. The union member, with raised voice, declared that what the unions had they had fought for over the years. As they pursued their arguments it was clear that neither were well informed of the truth. Two good men but both ignorant of the truth. One had openly voted for and supported Obama and one who freely used the 'N' word. As I expressed an opinion that, while as a people blacks have not dismostrated their ability to abide by the rules reaping the benefits thereof, some blacks are outstanding individuals. The host, obviously a person who watched the Fox New Channel, spoke of inequities of unions. The host had been a union man all his life. Years ago I met the union man when he had been out of work for several months. I immediately told him to go to the plant manager of a local firm. I had trained that manager and if my friend told him I had sent him, I knew he would be hired. The union man laughed declaring that he could not afford to work at that company. He was right. He was collecting $20 and hour while idle and the small company paid less for working. My neighbor is currently unemployed. Like my union friend, my neighbor does any manner of "under-the-table" work. NEITHER OF THESE MEN WILL EVER WORK WHEN THEY CAN BE PAID FOR NOT WORKING. Not all unemployed are so well paid. I have family who was unemployed who desperately searched for work. When my wife and I were unemployed, benefits were paid for six months. We collected for three months as we traveled around the nation. Then, I went to work as a straight commission salesperson and my wife took a split shift job at McDonalds. Such jobs are available today. READ MY BLOG OF DECEMBER 7TH, 2008. At that time big, black headlines declared that UNEMPLOYMENT RATE EXPLODES! The unemployment rate had gone from 6.5 to 6.7 per cent. YES, 6.7, the average of the previous 50 years. You will not see one comparable head line today as unemployment remains in the 10 percent range. Check the chart below. Although our great grand children have been put in hock to pay for the waste, all the money that the government has wasted has failed to turn the unemployment picture around. On December 7, 2008 only the results counted - unemployment went up from 6.5 to 6.7 percent. Today the result, 10 percent unemployment, is not to be counted. Today we are only to consider all the jobs that have been saved. Again, what bull! Good old Mark Twain was right, "Figures don't lie but liars figure". 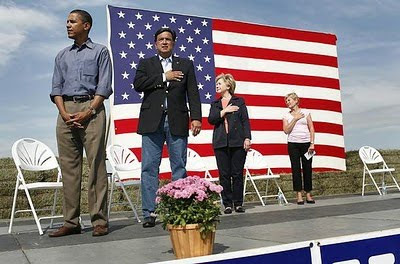 Please remember this picture of Obama being disrespectful to a pledge of allegance to our flag and plan to vote in a little over a hundred days. God Bless us each and everyone and God bless the USA.